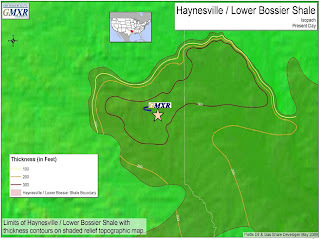 In a presentation a couple of weeks ago, GMX Resources provided additional detail on the geology it is seeing in the Haynesville Shale. 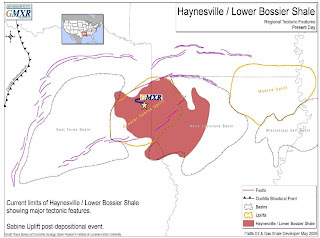 Although I don't have a background in geology, I was interested in some of the company's images regarding how the Haynesville Shale came to be and how it sits now in the larger geological context. 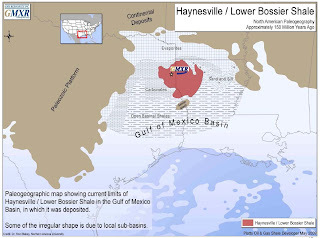 GMX also included an isopach map in the presentation showing the thickness of the Haynesville Play across most of its span. The clear spin from GMX's perspective is that they are in the thickest part of the shale. While that is good, there are other factors, such as pressure, porosity and completion techniques, that determine the quantities of gas produced. Thicker is good, but there's more to it. 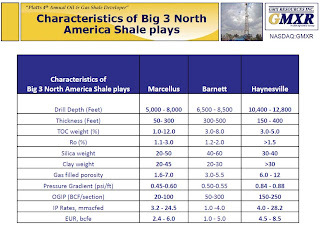 The presentation also summarized some of the key geological differences between the Haynesville, Marcellus and Barnett Shales. Some of these differences have been quantified elsewhere, but I thought this was a very good summary. Not that it's a competition, but I was pleased to see that of the three shales the Haynesville has the highest per well estimated ultimate reserves (EUR). You probably meant to type "isopach" not "isopatch." An isopach (pronounced eye-so-pack) is a map of thickness.